How often do you think about your garage door opener? Most homeowners don’t ever think about this device, unless something goes wrong. Unfortunately, as a very complicated piece of machinery, the motor unit can often develop problems that aren’t very obvious. Drive gears can wear out, safety sensors can require adjustment and circuit boards can fail. Our technicians have the skills and the expertise to quickly pinpoint the root cause of the problem and provide a quick solution. If your opener isn’t working quite right, or if you're looking to upgrade to a newer model, it’s time to get in touch with us. All modern openers are controlled by a central circuit board, and in many ways this is the “brains” of the entire system. This is the component that tells the motor when to start and when to stop, and it plays a key part in ensuring safety and functional integrity of your automatic system. However, as we all know, technology isn’t infallible; circuit boards can and do malfunction occasionally, and when they do they need to be replaced. Our company works with all the major brands, from Genie and Craftsman to Linear, so you can count on us to quickly find and install a replacement circuit board for you. The key link between the opener and your door is the drive system. This consists of a chain, belt or screw that pulls and pushes the door up and down. A corroded chain or a torn belt can severely impact your motor unit's performance, requiring a quick replacement to avoid potential breakdowns. No matter what type of drive you have, our team will be able to remove and replace any damaged part, from the trolley to the rail, and bring the opener to working condition once more. 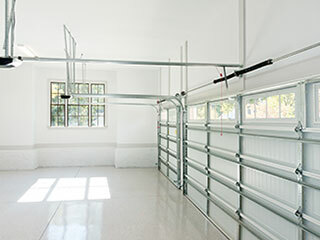 One of the best things you can do for your garage door is to install a new opener. Modern motor units are faster, quieter and more secure than old ones, and they often come with a wide range of convenience-enhancing features. Get in touch with our team at Garage Door Repair Hoffman Estates today to learn more about the different options available today. Our experts will be happy to help you find the perfect new opener for your home.